Smith Brothers Supports CT Children For 10th Straight Year. Smith Brothers Insurance in Glastonbury sponsored 35 children in need, and raised approximately $7,000 for the 2016 Holiday Bear Project through the Connecticut Education Foundation. 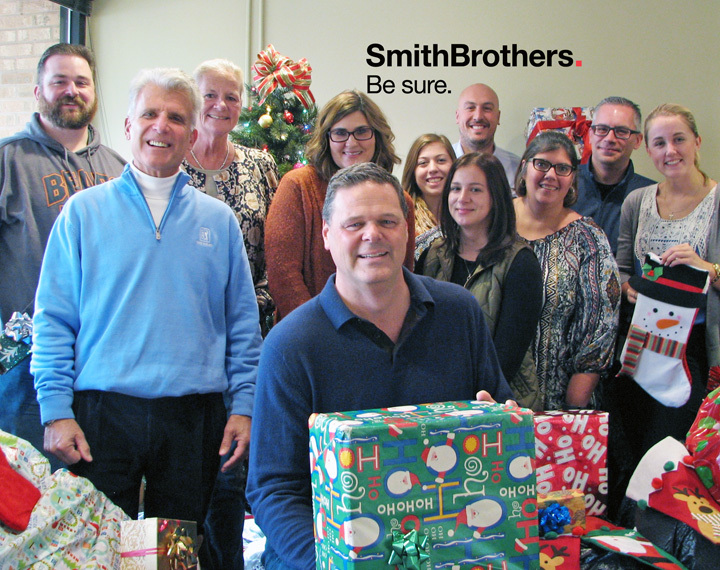 This is the 10th straight year that Smith Brothers’ employees donated money and time for this annual gift-giving program for public school children in Connecticut. Hundreds of gifts were purchased and wrapped for students that ranged in age from five to 17, and were donated to students in the Danbury and Waterbury school system. “These types of fundraising events are planned by the Smith Brothers Event Committee whose mission is twofold: coordinate events to help others, and enhance our workplace environment by encouraging teamwork, both of which will result in making our company a great place to work,” said Joe B. Smith, president & CEO, Smith Brothers.